As of 1900, my 3x-great-aunt Rosa Goldschmidt and her husband Bernhard Metz had four children still living: Hattie, Paul, Edwin, and Joseph. I’ve discussed Paul Metz, aka Joseph Raymond, aka George Raymond’s disappearance in 1900. This post will discuss his younger brother Edwin, who was also proved to be elusive. Searching for Edwin Metz was not nearly the wild ride I experienced in searching for his brother Paul, but it sure had its challenges. As of 1900, he was still living with his parents Rosa and Bernhard in New York City, working as a merchant.1 In the 1905 New York State census the household included Bernhard and Rosa, Hattie and her husband George Gattel, Edwin, and Joseph. This enumerator had the worst handwriting! Can you decipher what Edwin was doing? It sure had me confused, but as you will see, I eventually figured it out. Answer to follow. I thought this was probably the right Edwin Metz since the age (35) and birth place (New York) and birth places of the parents (both Germany) were right, but I wasn’t sure. What made verification difficult was that I could not find one other record for Edwin Metz. He was not on any later census record, and I could not find a marriage record or a death record or even a newspaper article about him. 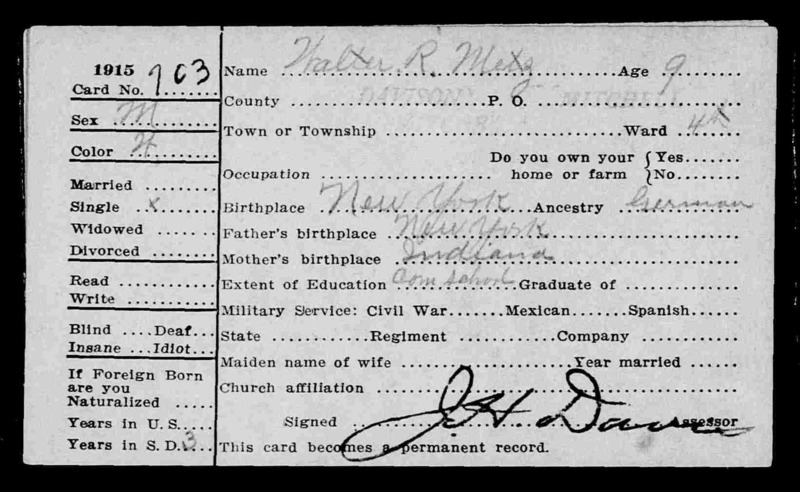 I focused my search then on Gertrude and Walter, which was also difficult because I did not know Gertrude’s birth name or anything else about her, except what that 1910 census revealed: that she was then 33, born in Indiana in about 1877 to parents who were both born in Germany. And I knew that Walter was born in New York in about 1906. Not much to go on, but enough to get a start. 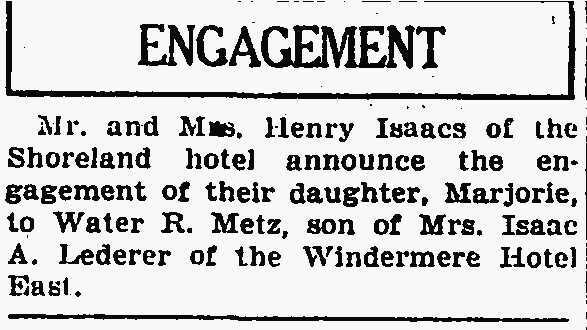 First, I found a marriage record dated May 20, 1918, for a Gertrude B. Metz and an Isaac Lederer in the Cook County, Illinois Marriage Index on Ancestry.2 I then was able to find Isaac and Gertrude on the 1920 census with Isaac’s son Joseph and his stepson Walter R. Metz, now 13, living in Chicago. I was quite certain this was the same Gertrude and same Walter who had been living with Edwin Metz in 1910 because the names, ages, and birth places lined up. But where was Edwin? Had he died? Or had Gertrude divorced him? And was he even my Edwin anyway? Then I found entries on the 1915 South Dakota census for Gertrude Metz and Walter Metz. South Dakota? That surprised me. But they lined up with the Gertrude and Walter I’d found on the 1910 and 1920 US census records: Gertrude was 38, born in 1877, in Indiana, and her parents were born in Germany. Walter was nine, born in 1906, in New York, to a father born in New York and a mother born in Indiana. And most importantly, Gertrude listed her marital status as widowed. Gertrude Metz, South Dakota State Census, 1915,” database with images, FamilySearch (https://familysearch.org/ark:/61903/1:1:MMHN-CGX : 5 August 2017), Gertrude B Metz; citing State Historical Society, Pierre; FHL microfilm 2,283,681. Walter Metz, South Dakota State Census, 1915,” database with images, FamilySearch (https://familysearch.org/ark:/61903/1:1:MMHN-CPH : 5 August 2017), Walter R Metz; citing State Historical Society, Pierre; FHL microfilm 2,283,681. Had Edwin died, or was Gertrude doing what many divorced women did in those days, hiding her status as a divorced woman? And why were they in South Dakota? The town where they were living, Mitchell, was a town with a population in 1910 of about 6500 people, located well over 600 miles from Chicago, where Edwin, Gertrude, and Walter had been living in 1910. How had Gertrude and Walter ended up in Mitchell? My hunch was that Gertrude had family in South Dakota, so I searched for a Gertrude born in Indiana in about 1877 who was living in South Dakota, and I found Gertrude Kleist on the 1900 census, living in Mitchell, South Dakota, with her parents Emil and Mina, both born in Germany. Her father was a peddler, and Gertrude was a music teacher. But that got me no closer to finding Edwin Metz. I went back to my newspaper searching. In my earlier search for Edwin, I’d had to limit my searches to New York and Chicago because the name was so common that I was overwhelmed with thousands of results. This time I decided to search for Edwin Metz in South Dakota, figuring that it was a crazy long shot. From this legal notice I knew that Edwin Metz had died sometime before July 1913, and Gertrude was a widow with a seven-year-old little boy. I then found “Edward” Metz on the South Dakota death index; he had died on June 12, 1913, in Davison County, South Dakota.3 It seemed likely that the Gertrude Kleist I’d found on the 1900 census living in Mitchell, South Dakota, was the same woman as Gertrude Metz. At first I was confused that Gertrude’s name was Becker, not Kleist as I had thought. I was surprised that there could be two Gertrudes in Mitchell, South Dakota, both born around the same time and both in Indiana, with parents born in Germany. And then I found Gertrude Becker and her family enumerated on the 1900 census; this is clearly the same family as the “Kleist” family in the page depicted above—Emil and Mina, both born in Germany, with daughters Gertrude and Margery and a son Delvin born in Indiana. The Becker and the Kleist entries are nearly identical, except Gertrude has no occupation listed and Emil has moved from being a “peddler” to being a “clothing dealer.” Once I searched for earlier and later records for the Becker family, it was clear that their name was not Kleist, or hadn’t been for a long time. Somehow they were counted twice on the 1900 census, once as Becker and once as Kleist. The Becker enumeration was on June 4, the Kleist on June 11, and one was in District 112, the other in District 113. I suppose it is possible the family moved between June 4 and June 11, but it seems unlikely they’d changed their surname from Becker to Kleist. Without transcribing the entire wedding article, I can point out several revealing portions. 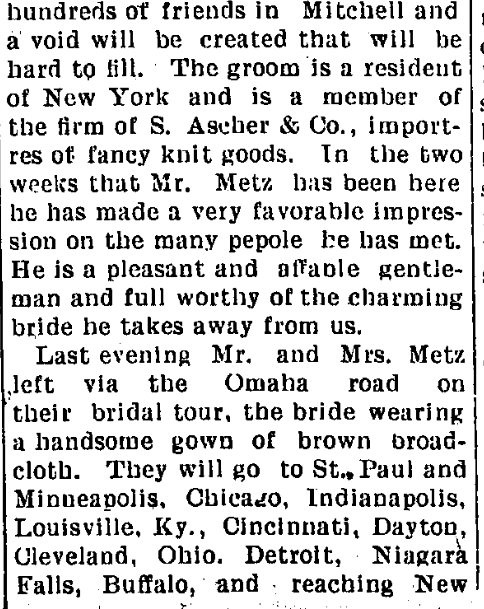 First, Edwin Metz was from New York City and was working for “the firm of S. Ascher & Co., importers of fancy knit goods.” Looking back now at the 1905 New York State census when my Edwin was living with his parents, I think the enumerator wrote “nit goods salesman” as Edwin’s occupation. Bad handwriting AND bad spelling. And now reading the 1910 US census for Edwin, I can see that it clearly says “knit goods.” (Amazing what context does to help decipher bad handwriting.) 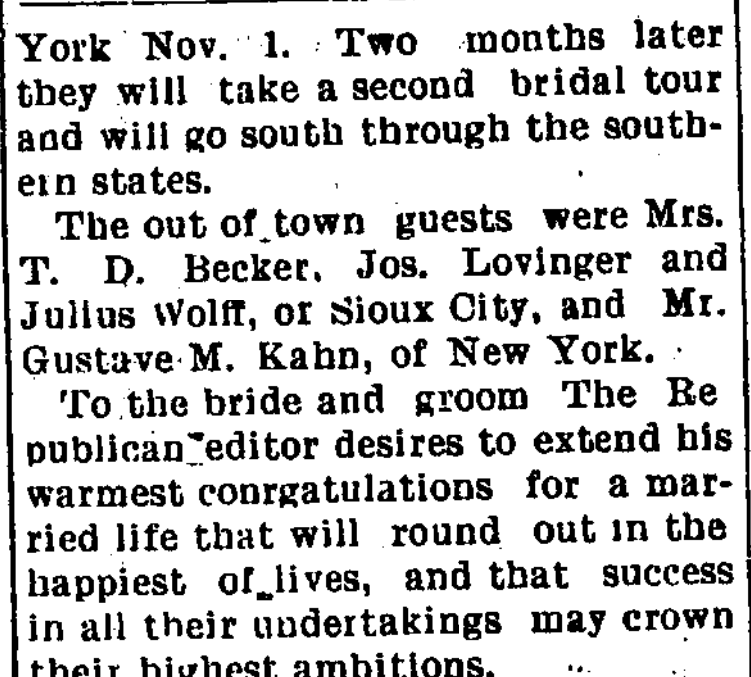 So I am persuaded that the Edwin Metz who married Gertrude from South Dakota was in fact my cousin Edwin. Coming here as a little maiden the bride has grown to womanhood in this city and has always been prominent in musical and social circles. She is possessed with a beautiful soprano voice of high cultivation and times without number has her music brought pleasure to hundreds of hearers. Always generous with her musical ability she has responded many times to assist in musical entertainments that have been enhanced by her presence. She has been a great favorite socially and was the life of any party of which she formed a number. Her going away will be much regretted by her hundreds of friends and a void will be created that will be hard to fill. But if Edwin and Gertrude were married in October, 1903, why wasn’t she living with him on the 1905 census in New York? The New York census does not record marital status, so I don’t know. Perhaps she had just been left off by mistake? Edwin and Gertrude’s son Walter was born on February 28, 1906, so certainly in 1905 they had to have been living together for some time. I also was surprised to see that a rabbi performed the ceremony; he came from the “Jewish church” in Sioux Falls, South Dakota, which is over seventy miles east of Mitchell; back then, that must have been a long journey. It also saddened me that none of Edwin’s family attended the wedding. I’d like to think it wasn’t that they didn’t approve or that Edwin was estranged from his family, but just that the time and cost of traveling from New York to South Dakota kept them from attending. 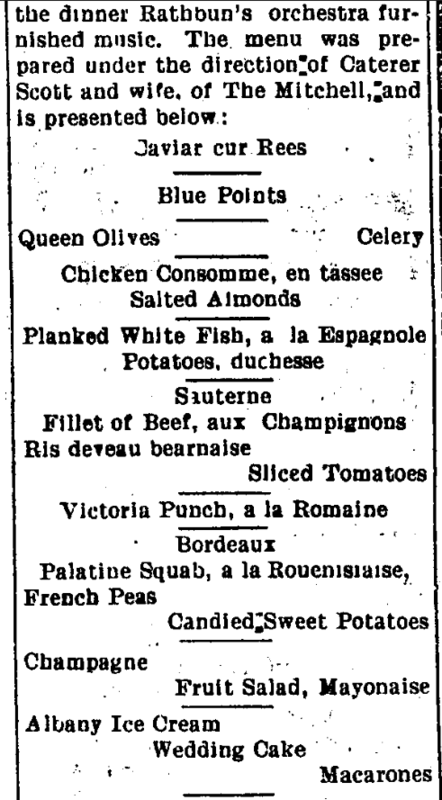 The wedding article was also very informative about the details of the wedding, including the lavish and extensive menu, the clothing, and the names of the twenty guests. 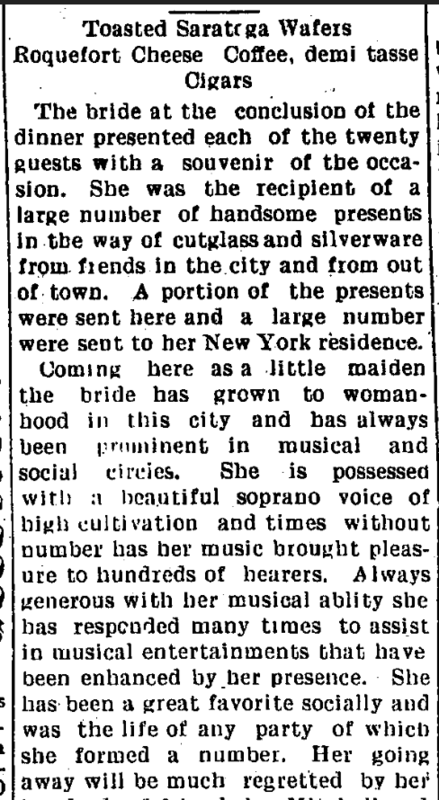 The article also hinted that Gertrude may have already been living in New York, as “A portion of the presents were sent here and a large number were sent to her New York residence.” Perhaps that refers to her future residence, but I like to imagine that Gertrude had come to New York City to pursue her musical career, as the article describes her considerable talent. 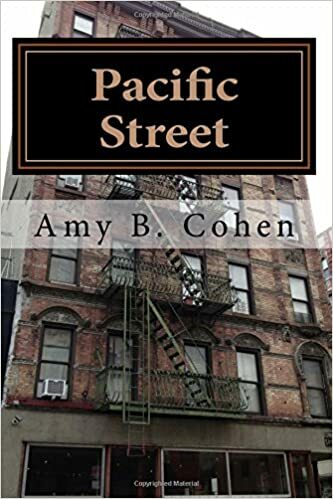 That would also explain how Edwin and Gertrude met, although it is also possible that Emil Becker, the clothing dealer, met Edwin, the knit clothing salesman, and introduced him to his daughter. That left me with a few remaining questions: why was Edwin in South Dakota in 1913 when he died? Was it a visit, or were they living in Mitchell at that point? Edwin was only 38 when he died—what caused his death? And where is he buried? This doesn’t tell me everything, but it does tell me that Edwin had suffered from “nervous trouble” since early 1912, and it suggests that he and Gertrude had moved to Mitchell for family support. Edwin died in the home of his in-laws, and his brother-in-law accompanied his body back to New York for burial. Gertrude was herself too ill to go. Of course, every answer leads to more questions. What kind of “nervous trouble”? Why was he being buried in New York and not in South Dakota or Chicago, the two places he and Gertrude had lived together? 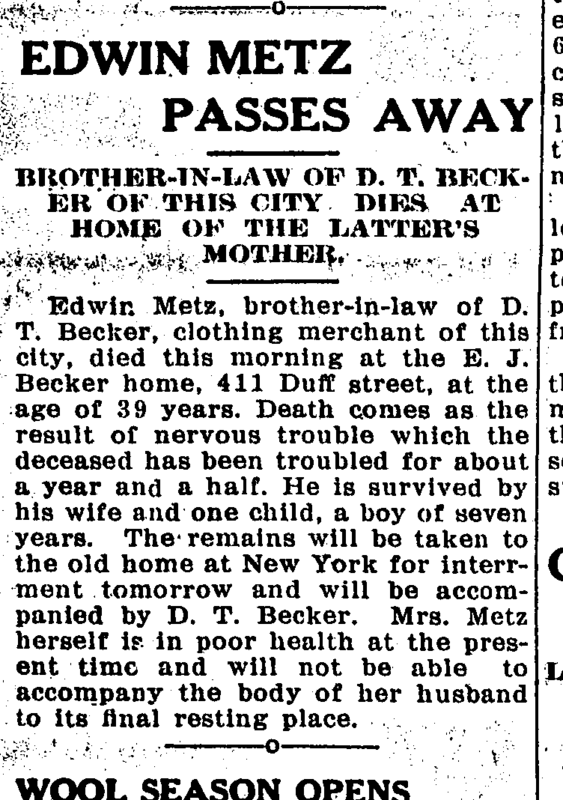 Sadly, my cousin Walter Metz inherited some of the bad luck of the Goldsmith family and died at a young age like his father Edwin. He was only 57 when he suffered a heart attack on March 1, 1963, while on a cruise in the Caribbean with his wife Marjorie.9 He was survived by his wife, son, and his mother Gertrude Becker Metz Lederer, who was about 87 at the time. Despite searching every way I can imagine, I have found no clue as to when Gertrude died, though I would assume it was within ten years after her son Walter’s death. Was she buried with her first husband, just as her second husband Isaac was buried with his first wife? I do not know. I cannot find her. I have contacted the cemetery where Edwin is buried to see if she is buried there and am awaiting an answer. 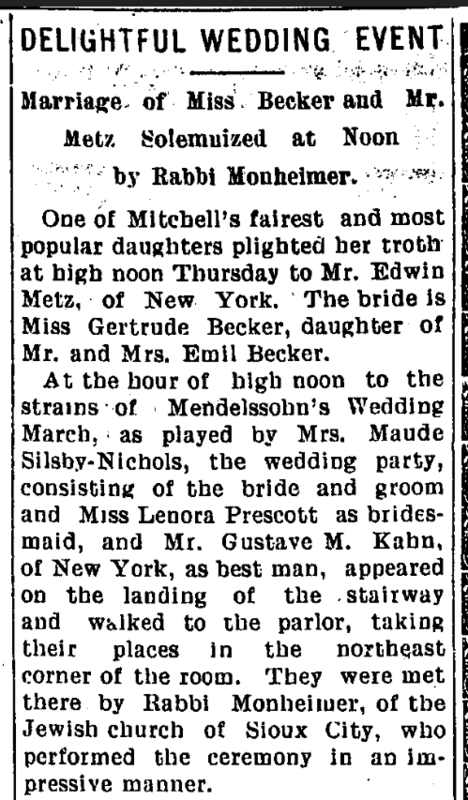 UPDATE: I just heard from the cemetery; Gertrude Metz Lederer is not buried with Edwin at Beth El Cemetery in New York. This entry was posted in Chicago, Genealogy, Goldschmidt/Goldsmith, New York, South Dakota and tagged Goldschmidt, Goldsmith, Metz, New York City by Amy. Bookmark the permalink. On the 1880 census, she is listed as “Gertie” when she was four. 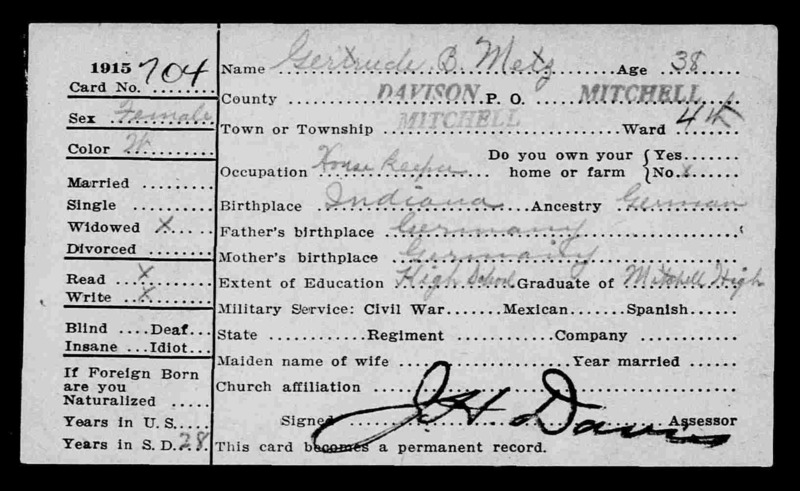 I have not been able to find an Indiana birth record for her, and by the time of her marriage it was clearly being spelled with the E as it was on the 1900 census. Thanks, Peter! I read knit goods on the census image but thought I might have been influenced by one of your previous posts. Then the wedding announcement confirmed his work had to do with importing knit goods. Question: do you keep a strict log of the many searches you do while researching for the articles? No, not really. I often jot down notes, and I also put notations on my Ancestry tree to help me remember how I found something—if I remember to do it. It’s one reason I keep the blog. I often start writing posts long before the research is done, as with this one, so that I can see where there are holes. Then I can incorporate my research process into the post. You make me feel so much better about how I keep track of my searches. Phew! I was afraid I was doing something all wrong. I certainly have moments when I go back to people I researched a while back and look at an entry on their profile and say…”How did I know that? ?” Very frustrating. But we all do the best we can do. tie in with her interesting life story. I know. I sure wish I could find that answer or at least when she died. Maybe she married again after Isaac died. My family doctor when I was a kid was named Metz. He was my first experience of seeing the numbered tattoo from the death camps. Those things do stay with you. I remember my first experience also—a man attending my cousin’s confirmation in 1963. I remember asking my parents about it and feeling empty after they explained it. Thank you, Sharon. Yes—I also was surprised by how small the wedding list was. But it was a relatively small town in South Dakota, so that does put it into perspective. That news coverage of Edwin and Gertrude’s wedding really is a treasure. I could picture the wedding party, the room and the reception very well. Of course not all of it but there was enough there to give expression of what a happy day it was and how well both were thought of in the town. 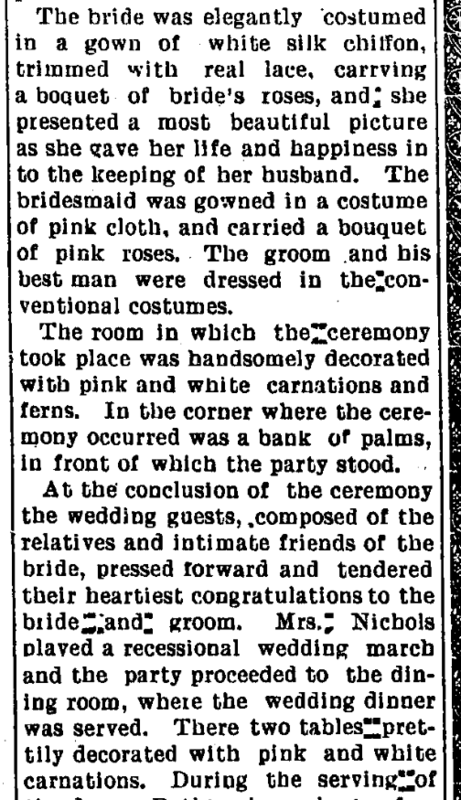 I guess one advantage of growing up in a small town is that the newspaper has lots of room to write a very detailed wedding story.! But I’ve also seen some pretty long and detailed stories of weddings in Philadelphia. But not as much as this one! Yes, that one I could decipher. Thanks!